Eastern Europe. There is no place like it in the world. The centuries of history aside, its natural scenery is just breathtaking; the landscapes intriguing. One of the countries that highlight the best this part of Europe has to offer is Slovania, a little country endowed with pretty much everything: wild rivers, lakes, mountains, caves, gothic castles, beautiful cities, villages, a piece of the blue seas, castles and more castles. Previously part of Yugoslavia, Slovenia’s location on the global map still remains a mystery to many, as the country itself. It is often confused with closely-named Slovakia, which rose from Czechoslovakia. The almost similar name aside, the two almost share a boundary, with only Hungary sitting between them (to the northeast). Austria is another neighbor on the northern side, with Croatia lying to the south and southeast, and Italy to the west. Heck, even the flags look similar. Save for the crest. One of the best ways to build a mosaic of the country is to tour the major destinations. Here then, are the 20 things you need to see in Slovenia. Ljubljana – like most Eastern Europe destinations – is yet to become a tourist haven as the Western counterparts. That can only be good news, of course. The city is a historical treasure full of striking baroque, renaissance and art nouveau buildings, complete with nice restaurants, bars and pubs. And it doesn’t end there. Natural monuments are a characteristic feature of its surrounding, and so are protected parks. While we are talking cities, another must-see location is Piran, a Venice of sorts that even has its own version of the campanile of St Marco in Venice – St George Parish Church that boasts a separate bell tower and baptistery. Notwithstanding, Piran is one of the most beautiful cities you’ll come across in Slovenia. It is rich in history and boasts amazing architecture, with medieval buildings giving the old port such an impressive spectacle. Maribor is the second largest city in the country and serves as the administrative capital of Slovenian Styria. Tracing its roots to the thirteenth century, it’s a highlight for the history enthusiast with landmarks that include the Old City that is surrounded by medieval towers and remains of city walls; a museum and Baroque statue of St Florian; Grajski Trg Square where stands the Maribor Castle (the city’s chief architectural monument); the Main Square, aka Glavni Trg, where stands the City Hall and plague column; Aloysius Church among a host of other attractions. And of course, we can’t forget the Stara Trta, the world’s oldest vine and one of the largest wine cellars in the entire Europe. Making its way through Triglav National Park and rising in the Julian Alps, the Soca River is a hotspot for rafting and kayaking fans. The ridiculously clear emerald-blue waters makes for one of the most beautiful rivers you’ll see in Slovenia. Keeping with the waters theme, you also don’t want to miss Lake Bled, one of the most famous and most visited spots in the country. It is named after the town of Bled which is a tourist centre itself and a popular spa resort. A symbolic feature of Slovenia, the lake is surrounded by mountains and features an island in the middle. 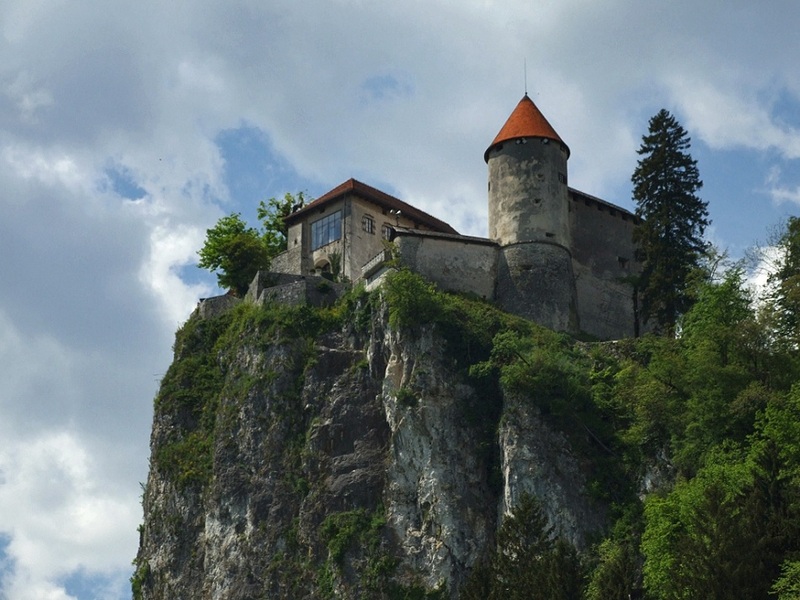 The best views can be caught from the Bled Castle, another medieval marvel that stands 130 metres atop a steep cliff overlooking the glacial lake (Image at the top). The million-dollar views here are to die for. Absolutely spellbinding. 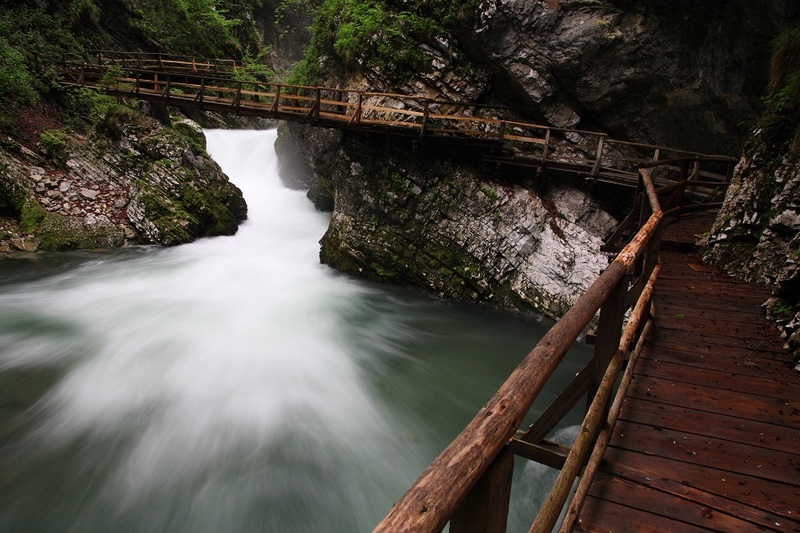 Not so far from Bled is Vintgar Gorge, aka Soteska Vintgar, which features an interesting man-made walking trail just above the emerald waters of the River Radovna. It’s one of Slovenia’s most popular natural features and it’s easy to see why. The river-carved ravine runs deep with steep vertical walls lining the side. It is here that you’ll also find the largest waterfall in Slovenia. A bar awaits at the end. A visit to Slovenia wouldn’t be complete without a tour of the world-famous Postojna Cave, another huge tourist draw. The visit starts with an exciting train ride, followed by an exciting saunter of the cave’s most attractive parts that are open to visitors. Temperatures in the cave average 10 °C even in summer so remember to bring along something warm. Portoroz – the Port of Roses – has been hailed as the Slovenian Monaco. This is home to some of the largest modern marinas on the Adriatic and is the business when it comes to coastal tourism trade in the country. What it lacks in the Venetian old towns you’ll find in the half a dozen or so notable towns along the coast, it makes up for in a slew of hotels, restaurants, spas, casinos and conference centres which make it a huge magnet for both locals and foreigners alike. It’s also a great launch base for excursions and day trips further afield. This is a picture-perfect thousand-year-old medieval city located about 25 kilometres from the capital (Ljubljana) and provides for one of the most rewarding day trips. The quaint town of Skofja Loka (Slovene for Bishop’s Meadow) has been incredibly preserved which automatically makes it the chief attraction. Ostensibly, every building, alleyway and bridge has a story to tell and an experience guide can lift a lid on some most intriguing legends, history and culture. Located 9km from Postojna is the one of the most intriguing and awe-inspiring castles you will ever see anywhere. 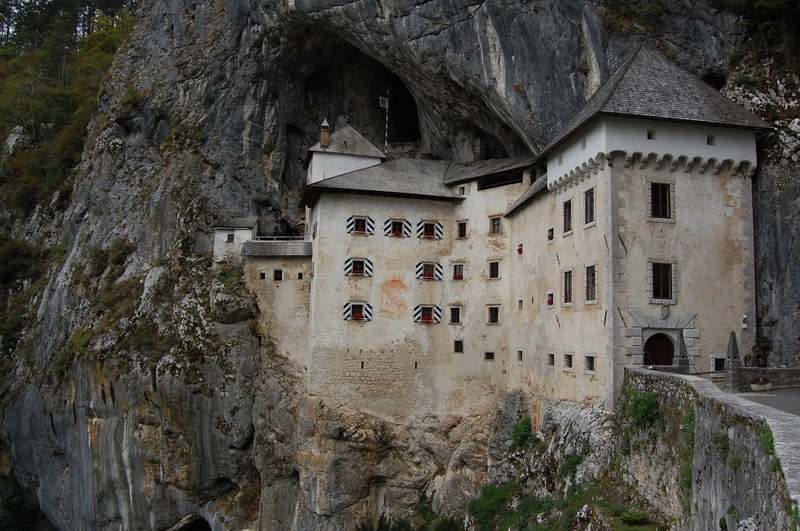 Clearly meant to be an impregnable fortification, Predjama Castle was just that: impenetrable. Especially considering the fact it was built at the entrance of a cave, not atop the rocks like most others. There are many floors open to tourists – including children – and discovering all the passages is a thrill, including one on the top floor that links to the cave hidden behind the magnificent castle. Passing at an elevation of 5,285 ft (1,611 m) above sea level, this is the highest road pass in Slovenia and most famous pass in the Julian Alps. It was built during World War I by Russian prisoners of war, and this is why the road leading to the summit is known as Rusca ceta – the Russian Road. It links the Upper Sava Valley with Trenta Valley and remains closed an average of five months a year, particularly during the winter months when it’s rendered impassable. 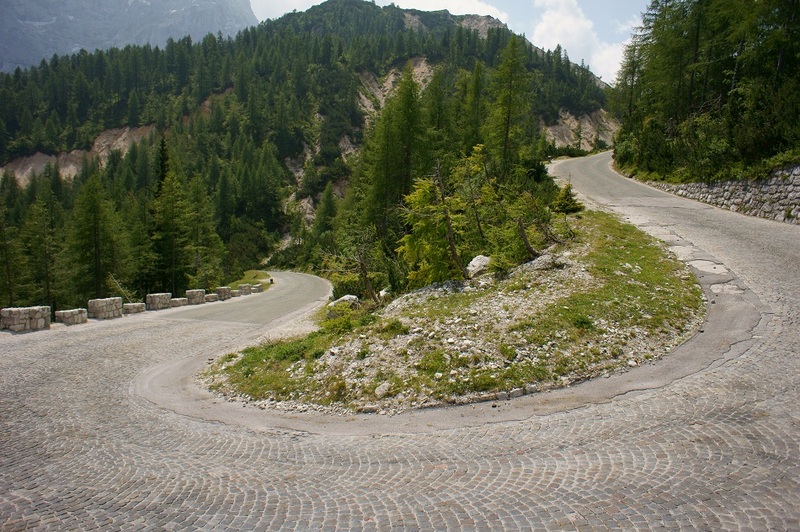 It’s a wonder, and if you’re a cyclist, this is the mother of them all. Hrastovlje is a small village located about 14 km from the town of Koper. It’s most famous for the unique Holy Trinity Church, an aisled Romanesque church dating back to the 13th century. It is palisaded by a defensive wall that formed part of the fortification against Turkish raids. It has been classified a UNESCO World Heritage Site. This is another beautiful reminder of the paradise that is Slovenia. The artificial lake situated near Kranjska Gora is not far off from the Triglav National Park and can’t miss it if you’re making your way to Vrsic Pass. If panoramic views invoke warm emotions in you, you will LOVE the picturesque scenery you’ll find here, thanks to the mountains that surround the lake. Slovenia is home to dozens of castles and it just feels wrong to visit only one. While all castles you’ll come across are wonders in their own right, Sneznik Castle is one of the most attractive from the interior perspective. The best thing about it is that the original furniture is still in place in all the rooms which makes it feel like a step back in time. Ski enthusiasts will fancy a trip up the Krvavec, which is not too far from Ljubljana. It is the most famous ski slope in Slovenia and this says a lot. Anyone who thought waterfalls are overrated ought to check out the Savica. 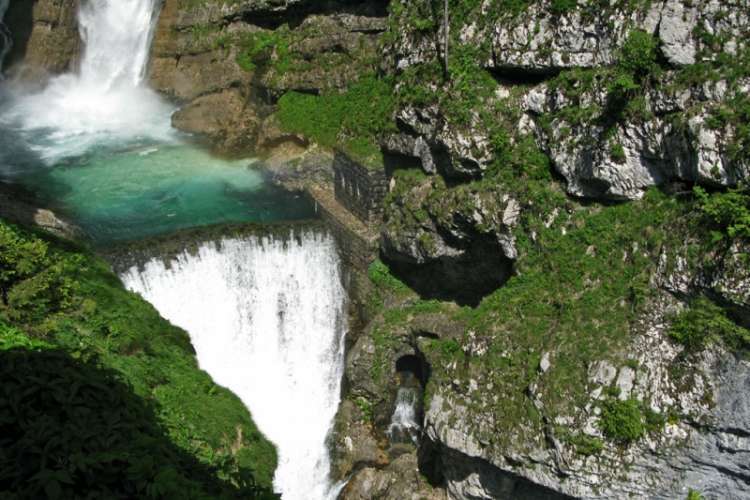 Located beside the Kozjek Waterfall, Savica is one of the most scenic falls in Slovenia. Triglav National Park is the only national park in Slovenia and home to the highest mountain in the country, Triglav, which stands at 2,864m. This is a must-see attraction for anyone who’s into mountains, nature, hiking and the like, for – among other mouth-gaping attractions – it features multiple mountains, waterfalls, lakes and more. Ensure you have proper gear like a hydration backpack if trekking in summer. This was the first Carthusian monastery outside of France and Italy, the first in the German lands. Located in southern Styria, the Zice Carthusian Monastery was founded in 1164 and housed monks who came directly from the mother monastery near Grenoble, France – the Grande Chartreuse – weaving their way through the forest. If you want to get a glimpse of one of the oldest European pharmacies, then Olimje is the place to go. This is the third oldest monastic pharmacy in Europe, after Paris and Dubrovnik. It is situated on the ground floor in the southern tower, beautifully decorated with frescoes by a painter named Anton Lerchinger back in 1780. 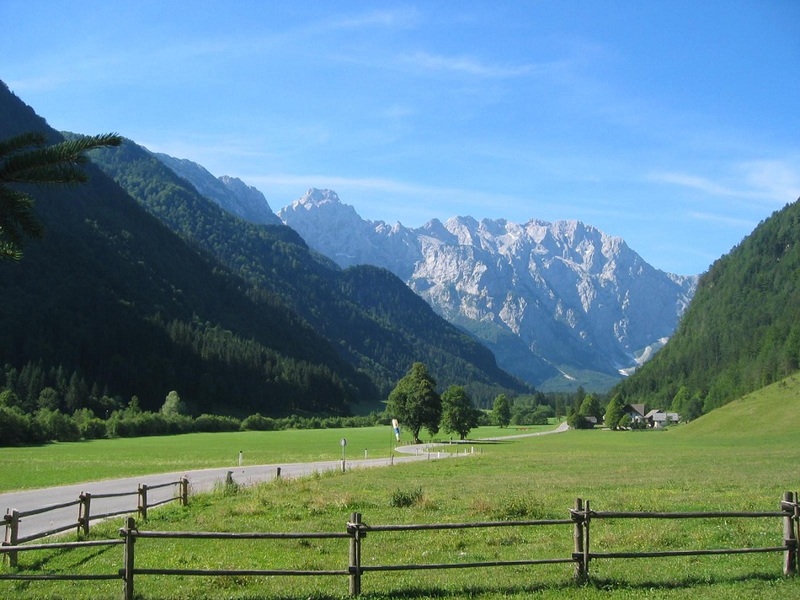 The Logarska dolina is a 9-km long glacial valley that is one of the most beautiful in the entire Europe. The valley, earmarked as a natural reserve since 1987, can be found at the heart of the Kamnik-Savinja Alps.